The Barbados flag stands out with its three bands of color: two deep blue bands with a golden yellow band down the middle of the flag. In the central golden yellow band of color, there is a broken trident in a black silhouette in the center. 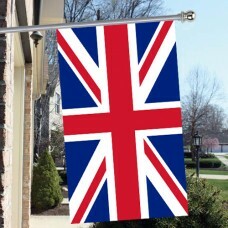 The flag is commonly referred to as "the broken trident" and the design represents multiple aspects of the country's history and natural features. 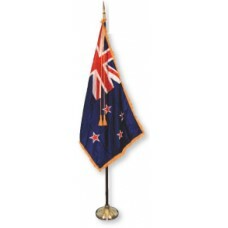 The deep blue bands are said to represent the sea surrounding the country. The golden band of yellow represents the sand of the golden beaches of the country. 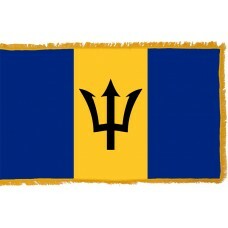 The black trident design came from Barbados' colonial badge. On the badge, the trident of Poseidon is depicted with Britannia holding it. 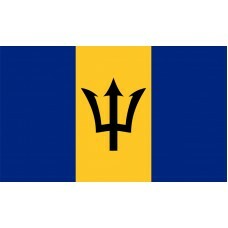 This symbolizes Barbados' break from its status as a colony of Britannia. The three pints of the trident represent government of the people, government for the people, and government by the people. The Barbados Government set up a competition for the public to send in their design ideas for the flag. There were over one thousand entries, and Grantley W Prescod's entry of the Broken Trident design was chosen. The Barbados flag was first flown and adopted on November 30th, 1966, which was the first day of independence for Barbados. Barbados is said to have evidence of Amerindian settlements dating back to the second millennium BC. Arguably, there is not enough substantial evidence to investigate the true period in which people settled there, but, there are consistent documents which record settlements from 350 and 650 AD. These were known as the Saladoid Barrancoid and came from the mainland's of South America. The second well documented settlers came around the year 800 AD and were referred to as Arawaks by the Spanish. The third settlers to come in the 13th century were the Caribs, named again by the Spanish. The Caribs were more advanced as a culture and quickly became the rulers of Barbados over the previous settlers. They remained so for centuries. The first Europeans to discover Barbados were the Portuguese, who were traveling there on behalf of the Spanish Empire to capture slaves to be sold in other parts of the world. By 1541, the Spanish claimed there were no more Amerindian folk left to capture - they had either already been taken or had moved to more mountainous territory on other islands for better survival and protection. The British didn't reach the shores of Barbados until 1625, having spent the previous 25 years exploring North America and other Islands. It is documented that Britain made a claim for Barbados in 1620, but were not successful in establishing their settlement until 1625 in the name of King James I. In Barbados during the 1640's, sugar cane was being mass produced and the Amerindians were forced to work as slaves on plantations which were built across the country. During the centuries, the Amerindians suffered greatly under British rule. Slavery was finally abolished in 1834 and the Amerindians finally got their independence in 1962. They flew the flag of Barbados to mark their victory and separation from the British colony.